Adventus: What if they gave a sale and nobody came? I don't know much about protests, whether aimed at police or at corporations. My personal sentiments are more along these lines, actually. I don't have any statistics at hand other than those I've heard this morning on the radio. The internet tells me Black Friday sales were down, but also tells me that doesn't mean anything for holiday shopping. Except the one chart indicates Black Friday sales were down last year, too. And the other article argues Thanksgiving sales were up of last year, so sales aren't "down," but the problem with that argument is fairly obvious. As for me, I don't even know that this means anything, or that what it means is a reason to rejoice. It probably isn't. I wish it could be. The traffic near my house is not only down from this time last year, it's down, period. Let me explain: I live near a major shopping mall in the area, one that has expanded its reach to connect to new apartment buildings and office buildings running for several blocks to the east of the mall, all stretched out along the interstate that runs east-west through Houston. The buildings are literally linked, by skyways: it's like a mini-downtown designed by one developer. It will one day be a beehive of activity, I'm sure, as the office buildings fill with more than employees of the energy companies whose names dominate the buildings, and as the apartments eventually fill. For now, though, their impact on the area is negligible. But the Friday before Thanksgiving you'd have thought school had ended, and the last chance for a family vacation was Saturday. The traffic around my neighborhood was bad; was so bad I thought for a moment Christmas had been advanced to come before Thanksgiving this year, and everyone had just heard about it. By last Saturday, however, the one after Thanksgiving, traffic was so low around the mall I thought the place had closed early. I had occasion to go to the mall that day, and while the parking lot was crowded, and the mall was full, it was hardly the crush I associated with "Black Friday" weekend. Now, I have my own personal opinion as to why Black Friday gets such crowds to the stores, and it isn't the $5 TeeVees (now $200 is considered cheap, which for a 50" TV I guess it is; still, not worth it to me). The bookstore I used to work in was never busy on Black Friday; everyone who shopped there was at the mall, instead. I still believe they went there to get all the family out of the house. You're trapped with family on Thanksgiving Day: football and feasting prevail. But if those visitors don't leave until Sunday, as I understand most people do? What do you do with them? The museum? Who are we kidding? The park? Again, it is to laugh. You go to the mall. Climate controlled, confined so even youngsters can only get lost, not run into traffic, and with access to food and drink you don't have to provide again. Why not? So did fewer people travel this year? I dunno. But I can say, fewer people are dashing to the mall to shop; at least to the mall near me. Because the deals are now spread out over November, and Black Friday is no longer so appealing? 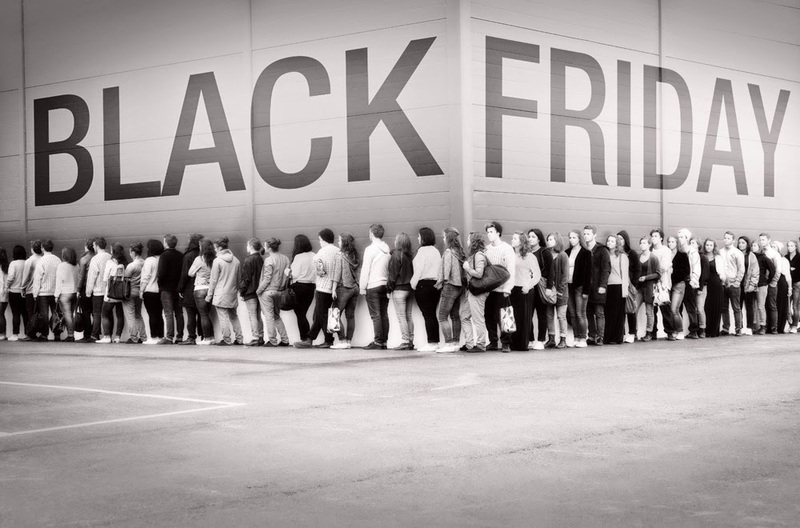 Because people can shop on Thanksgiving, and don't want to on Friday? I dunno. Going back to the articles above, there's a real desire among business interests to not see a decline in consumption, especially at Christmas. I think, however, the decline is rather obvious. I don't think it's protest against commercialization or police tactics. It's not because of a spiritual awakening, either. If I had to guess, I'd say the 1% has finally killed the goose that has been laying their golden eggs. I'd rather be wrong about that, too.